If nothing else, Occupy Montreal brought in a diverse crowd. From its origin on the Oct. 15 Global Day of Action up until the ultimate eviction two months later, people from almost all walks of life congregated in Victoria Square. Unionized workers, hippies, temporary refugees from the upper-middle class, pensioners, street kids from Notre-Dame-de-Grâce, anarcho-punks, suburbanites from the West Island or South Shore, Mile-End hipsters—and even some yuppies. The general assemblies were well attended. Musicians played to their hearts’ content. Part of the worldwide infamy Occupy Wall Street gained was because of its quasi-primitivist communal organization. Occupy Montreal followed suit. Soon, the kitchen got up and running, along with the first aid station and the media centre. They even had free clothing, courtesy of donors. As weeks went by, tents multiplied and Victoria Square became a colourful island in the middle of the business district grey, set off from the cement sidewalk by a marble border, like an inlaid jewel. As the occupation progressed, however, it began to take on an unexpected characteristic—a certain smell. It wasn’t anything unbearable, but body odour was definitely in the air under the canopy and network of tarps in the newly dubbed Place du Peuple, sheltering the bulk of the operation. The sections north of St. Antoine St. W. and west of Square-Victoria St. didn’t have much overhead cover, and weren’t as affected. But a few weeks in, the issue could no longer be ignored in the main segment. Our society has many so-called elephants in the room, but if there’s one that makes city dwellers the most uncomfortable, it’s homelessness. Occupy Montreal, which was supposed to be a political expression, saw a huge swell of homeless people, as did the one in New York, weeks before worldwide expansion. The camps also saw drugs, violence and crime; as much as pundits accused the movement of not having a focused enough mandate, Occupy encampments worldwide were also victims of their own success. Occupy was too welcoming—and not logistically prepared—to turn away elements that ended up sullying its reputation in the media and in the minds of the public. Beaucage has been homeless for several years. A man constantly abuzz with a certain nervousness, he often goes to the Old Brewery Mission—the century-old shelter and outreach center on St. Antoine St.—for food, shelter and to volunteer. His curiosity brought him to Place du Peuple. While Beaucage’s reasons for going to the tent city were benign, some say that the end result was less so. “Homeless people hurt the image of Occupy Montreal,” said Stéphane Marceau, a Montreal psychiatric nurse who spent most of his nights on site treating injuries and calming down rowdy people. Still, the Occupiers accepted the challenge. They had a mandate to be inclusive and to give safety to anyone at their camp. Originally, the homeless didn’t bother participating in the general assemblies or to take up tasks at Occupy Montreal’s various committees. But change can come through unexpected avenues. “After a few weeks, they were helping out and were developing skills they could use to integrate back into society,” Pittman recounted. It wasn’t just a one-way street process, either, however. By being inclusive and paying attention to one of society’s most marginalized groups, Occupy Montreal eventually got something back. 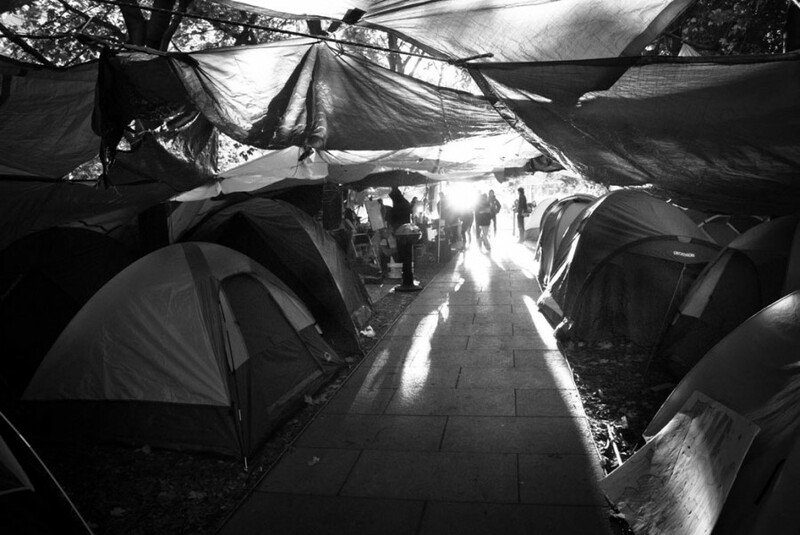 By taking part in the occupation, the homeless were able to live in a community. According to several members of the Occupy community, the newly minted Occupiers did their best to be helpful with absolutely anything. They served coffee, directed people who had questions, kept the encampment as tidy as possible, peeled potatoes—any number of little odd jobs to help keep the camp running smoothly. So how exactly did drugs and violence play into this? While the media threw homelessness, drug abuse and violence on the same boat, some spoke favourably of the homeless. They were able to distinguish between those perpetuating street violence and good people who needed help to get back on their feet. In fact, homeless Occupiers often helped keep the peace by confronting violent people. It’s a popular perception that mental illness is common amongst the homeless. The statistic that’s thrown around is that 40 per cent of homeless males suffer from a mental disorder. That number is even greater among women. Marceau explained that mental health issues are intensified with the consumption of drugs, and Place du Peuple saw no shortage of syringes—or other stuff. “This was the jackpot for all those drug dealers that prey on the homeless,” Marceau said. He admits that things were getting out of hand towards the end and that the homeless got singled out. “A bunch of community groups wanted to support us. They had the skills that we didn’t have because we’re not mental health professionals,” said Pittman, who lamented that the Occupiers were evicted before they’d gotten a chance to work things out in that regard. But now the issue is no longer in front of them. Two months after Victoria Square was emptied, those who took temporary reprieve there have found themselves back out in the cold. Former Occupiers occasionally run into the homeless from the camp—sometimes to their surprise. “We saw some people who we had no idea were homeless. Now we see them begging,” said Marceau. While Occupy Montreal was not a perfect haven for the lowest on society’s totem pole, for a couple of months, it provided them with food, a place to sleep, conversation and company—it gave them a community.